Although best known for producing higher end 1911 pistols and rifles, Kimber entered the revolver market at the 2015 SHOT show when they introduced the Kimber K6S revolver. This model is designed for the CCW and home defense market, and will compete in the small to mid-size revolver space that is currently dominated by S&W and Ruger. The K6S will focus on the same snub nosed revolver market as the S&W J frame series, Ruger SP-101, and the new Colt Cobra series. The Kimber K6S is produced from stainless steel, and features a 2” bull barrel. Chambered in .357, the K6S can also shoot .38 Special loads. Now here’s where the K6S differs from most of the other competition in the snubby market: the K6S is one of the few snub nosed .357 revolvers that has a true 6 shot capacity, and, with a weight of 23 ounces, is touted as being the lightest 6 shot .357 revolver currently on the market. The revolver is a DOA (Double Action Only) model with what Kimber markets as a “match grade” trigger with a 9.5 to 10.5 lb pull. The trigger is described as a “non-stacking” trigger that is smooth and easy to operate. The K6S comes equipped with low profile 3 dot sights that can actually be replaced if desired, which is another feature you don’t usually see on snubby revolvers. Most have fixed sights that can’t be adjusted or replaced without extensive gunsmithing work. Although the K6S was introduced at the 2015 SHOT show, availability has been hit and miss for a mass produced revolver with only a few showing up in gun shops here and there, and most are selling at top dollar. Kimber has indicated that they plan to ramp up production and make more available in the upcoming months. K6S First Edition – This model comes with a mirror polished finish, special grips, and is a limited run with special serial numbers. K6S LG – The “LG” designation stands for “Laser Grips” as this model is equipped with Crimson Trace laser grips. K6S 3” – This model features a 3” barrel instead of the standard 2” barrel on the standard models. 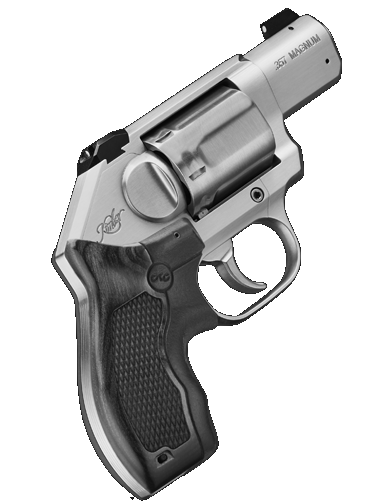 K6S DCR – The “DCR” designation stands for Deluxe Carry Revolver, and this model features special grips and a fiber optic front sight. K6S DC - The “DC” designation stands for Deep Cover. This version has a black DLC finish, black G10 grips, and tritium night sights. K6S CDP – The “CDP” designation stands for Custom Defense Package. This model features a two tone finish with a black DCL frame mated to the stainless steel barrel, along with special grips and night sights. #1 – I’ve read on a few internet forums that the K6S will fit in a holster for the Ruger SP-101 2 ¼” or a Colt Detective Special? Is that true? Based on the test fitting that we’ve done with a K6S, they don’t/won’t fit well in a holster made for either revolver. Remember the K6S is a 6 shot while the SP-101 is a 5 shot, so there is a difference in the frame sizes between the two. Your best bet is to find a kimber K6S holster model that is specifically built for the K6S frame. #2 – Will a holster made for the regular K6S fit one of the K6S models with the laser grips? Honestly, it’s hard to say as it really depends on the holster brand and style. Our experience has been that some holsters that are cut high on the gun won’t fit as the CT laser grip interferes with the revolver fully seating into the holster. That being said, we can help in that area as most any holster listed below is available in a version to fit the K6S with the crimson trace grips. Those holsters will feature a space cut out to fit the crimson trace laser grip area. #3 – I see that some of the holsters listed below have an option for a thumb break, but in the drop-down menu beside the K6 models there’s a note saying that a thumb break isn’t available so I’m confused? We understand how that could be confusing so let us explain. Most all the MTR holster models are available in a configuration where an optional thumb break can be added. However, the K6S models feature an internal hammer, so there really isn’t anything for the thumb break to wrap around or over to secure the revolver in the holster. That’s why the K6S holster models have a note saying no thumb break is available. #4 – If a thumb break isn’t available, then how is the holster retention for the K6S? Since the holsters for the K6S are molded specifically off a K6S mold, the fit is very close and tight. As a matter of fact, the holster will most likely have to broken in some before you could carry the K6S as it will be a little hard to draw without being broken-in first. #5 – Do you offer a pocket holster for the K6S? Given the larger size of the K6S, we don’t offer a pocket holster for it at this time. Any holster model that you see listed below is available as a Kimber K6S holster, and most holsters below are also available to fit K6S variants such as the laser grip model.